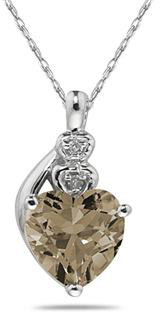 This beautiful heart shaped pendant has an smoky quartz gemstone with two diamonds set in 10K white gold. 2 round diamonds weigh 0.01 total carat weight. Heart shaped gemstone measures 7mm. The pendant hangs from a 18 inch cable chain included. We guarantee our Heart-Shaped Smokey Quartz and Diamond Pendant, 10K White Gold to be high quality, authentic jewelry, as described above.